Water is the most basic and indispensable of all natural resources – a finite resource we tend to undervalue and sometimes abuse, but cannot live without. In recognition of the fundamental importance of water to the province, the country and around the globe, the Andrews Initiative at the University of New Brunswick has declared 2012 the Year of Water and will present a series of outstanding speakers beginning February 16. The first speaker will be Maude Barlow, national chairperson of the Council of Canadians. Ms. Barlow will present a public lecture on Thursday, Feb. 16, at 7:30 p.m. at the Wu Conference Centre, UNB Fredericton. Admission is free. Ms. Barlow’s topic is The Global Water Crisis and the Challenge for Canadians. As a founder and the national chairperson of the Council of Canadians, Ms. Barlow has distinguished herself worldwide as a passionate and effective speaker on a range of critical issues. The council’s current focus is on water, particularly water as a human right. In addition to her work with the council, Ms. Barlow chairs the board of Washington-based Food and Water Watch. She is a founding member of the San Francisco–based International Forum on Globalization and a Councillor with the Hamburg-based World Future Council. 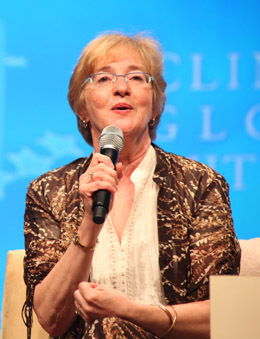 Ms. Barlow is the recipient of 11 honorary doctorates, as well as many awards, including the 2005 Right Livelihood Award (known as the Alternative Nobel), the Citation of Lifetime Achievement at the 2008 Canadian Environment Awards, the 2009 Earth Day Canada Outstanding Environmental Achievement Award, the 2009 Planet in Focus Eco Hero Award, and the 2011 EarthCare Award, the highest international honour of the Sierra Club (US). In 2008- 09, she served as Senior Adviser on Water to the 63rd President of the United Nations General Assembly and was a leader in the campaign to have water recognized as a human right by the Unite Nations. She is also the author of dozens of reports, as well as 16 books, including the international best seller Blue Covenant: The Global Water Crisis and The Coming Battle for the Right to Water.